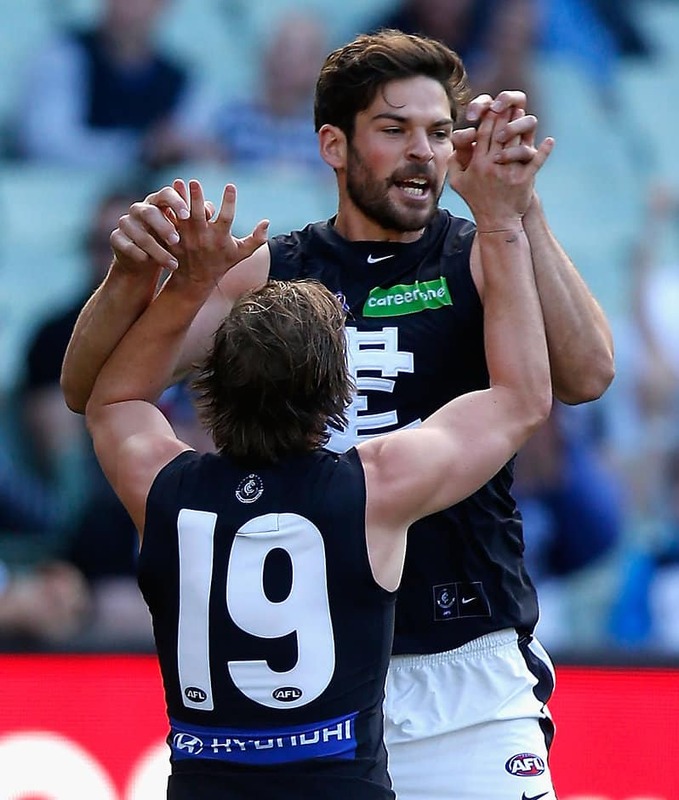 CARLTON has won its third game in a row and in the process heaped more pressure on under-fire Collingwood coach Nathan Buckley with a 15-point victory over the Magpies. The Blues outplayed their rivals throughout Saturday's contest at the MCG, closing out a 15.9 (99) to 12.12 (84) win in the second half in front of a crowd of more than 60,000 fans. It was the first time since 2013 that last year's wooden-spooners have won three straight games, and in the process they handed Collingwood its fifth defeat of the year. The spotlight will remain on Buckley and his struggling team after the loss, with the Blues clearly outpointing the Magpies across the contest and deserving the win. Carlton's win was built on midfield dominance and a presence in the forward-50 that couldn't be matched by the Pies. Kade Simpson (30 disposals), Bryce Gibbs (29 and three goals) and Marc Murphy (24 and one goal) were terrific, while Patrick Cripps' ascent into one of the game's best midfielders continued with nine clearances and 29 disposals. Dale Thomas, too, continued his improved form against his former side with 21 touches. But the story was forward duo Andjres Everitt and Levi Casboult, who proved far too dangerous for Collingwood's flat-footed defence. Everitt kicked three goals from 20 disposals and used his athleticism to impact the game, while Casboult also kicked three majors, including the sealer late in the final quarter. "They've had two six-day breaks, travel, and they listed a fairly young team but they kept coming, and the scoreboard was pretty tight until late," Blues coach Brendon Bolton said after the win. "We can't get too high, and we can't get too low. We're not in a position to do that as a club." Collingwood was led well by captain Scott Pendlebury (34 disposals) and star midfielder Steele Sidebottom (29) but lacked contributors across the board. Former Demon Jeremy Howe (22) impressed in the first half across half-forward line in his best game for the club, and Alex Fasolo was a focal point in attack kicking four goals. Coach Nathan Buckley lamented a lack of contributors in the defeat. "When you've got a handful of guys who lower their colours or don't bring anywhere near their best, [it shows] how much work needs to be done by less players," he said post-match. "We thought that was really the tale in the first half in particular." Carlton made the early running, with Liam Jones and Casboult offering strong marking targets in attack. Their presence helped the Blues to a 14-point advantage midway through the first quarter, but that was trimmed to two points by the first change after some smart work by Jordan De Goey set up Jesse White for a goal. Although far from the quality of the 1970 Grand Final – perhaps the most famous battle between the rivals – the Blues' intensity and the Pies' efforts to work back into form made for an even contest. Carlton's dominance near goal was reflected in the numbers, with the Blues taking five inside-50 marks for the term to the Pies' none. But it was really only Collingwood's efficiency that was keeping the Pies in the game at half-time, with the Blues holding an 11-point lead at the main break. They should have been further in front, too, after smashing Collingwood at the clearances (21 to 12 at half-time) and take the ball inside-50 on 10 more occasions. Too much was left to Sidebottom, who won 20 disposals in the first half but was largely playing a lone hand in Collingwood's midfield with recruit Adam Treloar tagged out of the game by Ed Curnow. Collingwood stepped up in the third quarter and continued to press, but the Blues responded whenever challenged. They moved the ball through the middle of the ground with more poise and direction, Thomas gave some spark on the wing, and their key forwards presented well. If they had converted properly the game would have been sealed much earlier. Casboult's inaccuracy in front of goal continues to plague him and took away from his excellent aerial game, with the forward taking 11 marks (five inside 50 and seven contested) in a commanding display. In total, Collingwood took just five marks inside 50, illustrating Casboult's say on proceedings. The Blues made their biggest run in the third term, as Gibbs booted three goals for the quarter to break the shackles and extend Carlton's lead to 30 points midway through the quarter. But two late goals for the Pies to Moore and Fasolo gave Collingwood some hope heading into the last term. Another quick goal from Levi Greenwood early in the last furthered the Pies' hopes of a comeback win, but Carlton, in a mature display, steadied and held on for the win. It was a victory that showed the Blues' progress this year under new coach Brendon Bolton, and also highlighted the Pies' downfall in 2016. Collingwood: The Magpies’ fitness issues came in the second half, with Tim Broomhead struggling with an ankle problem and Ben Reid hurting his shoulder. Carlton: Dale Thomas came off the ground to have work on his troublesome left shoulder in the first term, but returned to the field and played out the game for the Blues. Carlton will be aiming for four straight wins when it hosts Port Adelaide at Etihad Stadium next Sunday. The Pies travel to Brisbane to take on the Lions next Saturday night at the Gabba.